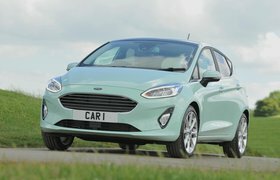 2018 Ford Fiesta ST passenger ride review - price, specs and on sale date | What Car? Let us consider for a moment some of the finest names in the hot hatch hall of fame: the fabled Peugeot 205 GTi has to be in there for starters, and so too does the much celebrated MK1 Volkswagen Golf GTI. But the list wouldn't be complete without the glorious Ford Fiesta ST. Indeed, the previous generation Fiesta ST was Ford's performance division at its very best. 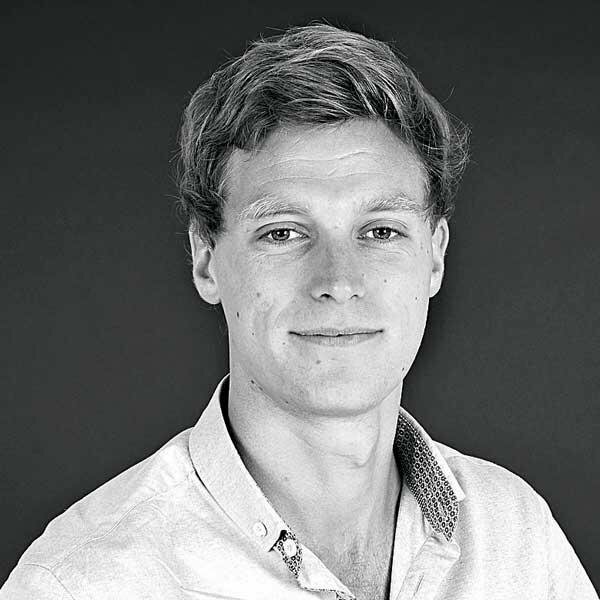 A keen price, a fantastic turbocharged 1.6-litre four-cylinder petrol engine and truly engaging handling meant it won no less than four Hot Hatch of The Year titles on the trot in our What Car? awards. The anticipation for the new ST has been huge, then, and Ford has been busy honing it to ensure the new model is even better than its legendary predecessor. So it seems strange to say it's lost a cylinder. Yep, the ST now has a turbocharged 1.5-litre three-cylinder petrol engine which features cylinder-deactivation technology, allowing it to run on just two cylinders at a cruise to save fuel. But, fear not, with all cylinders firing it kicks out a punchy 197bhp allowing a 0-60mph time of 6.5sec and a top speed of 144mph. Thankfully, performance is still very much the order of the day. Elsewhere, Ford has introduced the option of a limited slip differential designed to help this front-wheel-drive ST deliver its power to the road more effectively, stiffened the ST's body to help agility, overhauled its suspension to ensure it handles more keenly, yet rides more comfortably, and given it bespoke Michelin tyres for better grip. There's even a launch control mode for perfect trafficlight sprints. It pains us to tell you, then, that we were only allowed to sit in the passenger seat for our first taste of Ford's latest hot Fiesta. Still, it was a great chance to see how it's shaping up against rivals such as the Peugeot 208 GTi and Renault Clio RS. There's only so much you can tell about how a car drives while sat in the wrong pew, but we're confident when we say the ST's new engine is a cracker. Any doubts about fewer cylinders are quickly forgotten once you feel how hard Ford's 1.5 triple pulls from low revs and enjoys spinning up to its limiter, all the while accompanied by a muscular, growling soundtrack and proper pops and cracks from the ST's new sports exhaust. 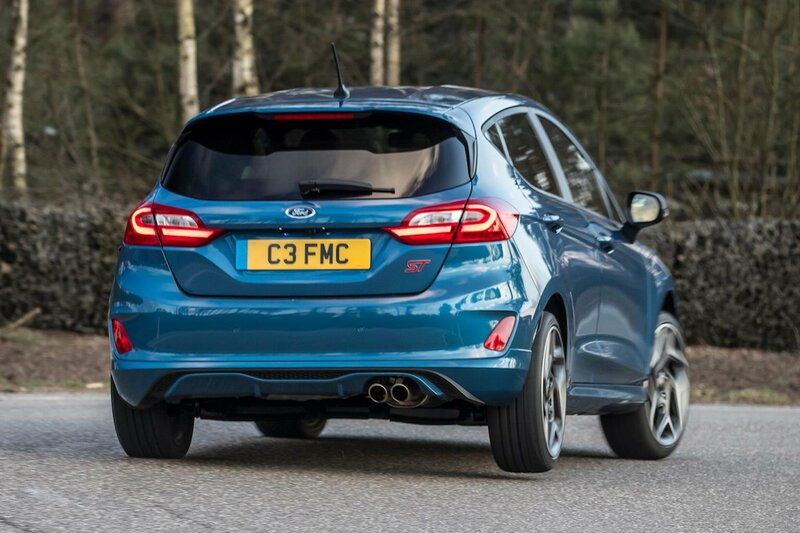 It's certainly the most aggressive three-cylinder motor we've encountered and Ford's standard six-speed manual gearbox looks to have a short, snappy lever and fairly short spaces between its gears. We were also shown how backing off and cruising allows the cylinder deactivation to happen, but in all honesty it's extremely difficult to tell that it's happening at all. Ford doesn't include a light on the dash to indicate any switchover and there's no perceivable change in sound or vibration inside. Which, let's be honest, is exactly how you'd want it. Ford has introduced three driving modes to the ST: Normal, Sport and Track. Moving to Sport from Normal makes the throttle more responsive, adds weight to the steering and makes the ST's exhaust more vocal. Moving to track switches off the car's traction control and relaxes its stability control for maximum control and, let's face it, enjoyment. 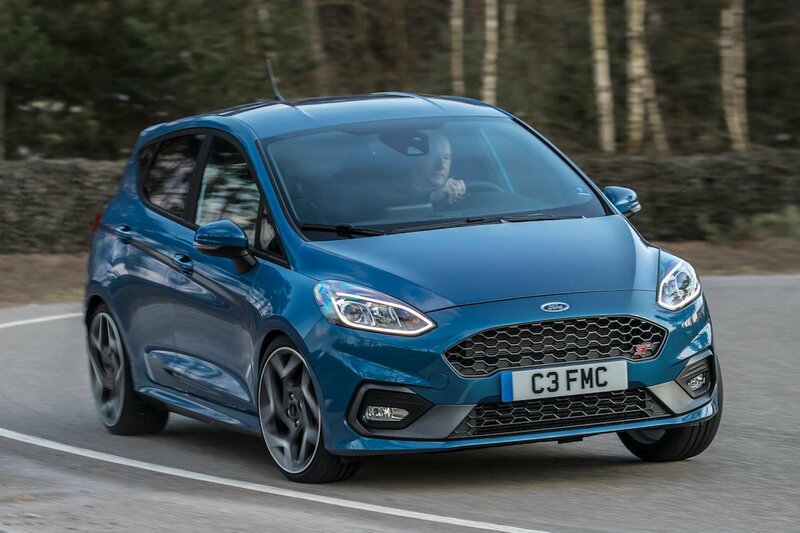 Unfortunately, truly appreciating Ford's efforts with the ST's handling through its driving modes will have to wait until we get behind the wheel, but it's clear that this hot Fiesta is no less lively through corners when provoked in Sport and Track settings. The way the last car could progressively pivot to help you position it through corners when backing off the accelerator was one of its great assets, and this new ST is no different. And a chance to experience an ST with and without Ford's new limited slip differential provided obvious differences for the passenger seat too. The diff will be available optionally as part of a Performance Pack on lower trims, but standard on the range-topping ST-3 model, and works with the ST's standard torque vectoring technology. Around Ford's cold test track in Belgium, the differential-equipped car was able to put down its power more readily out of slow corners as it sussed out which front wheel was struggling and sent more drive to the one with greater purchase. Alternatively, the non-diff car required more patience with the accelerator as it was left scrabbling for traction when pressing on too soon. If there was one slight criticism with the previous ST's drive it was its firm ride. Well controlled, yes, but there was pretty tedious vertical movement at speed. The new ST has new, more advanced dampers which are able to stiffen and slacken themselves (there's no switch for the driver) depending on the type of driving conditions. Ford has also patented the ST's new rear springs, which are curved in shape to improve stiffness while cornering. It's all clever stuff, but the important thing is that we found ride comfort is genuinely improved, yet body control through tight bends is as good as ever. OK, maybe there was another criticism you could level at the old Fiesta ST: its interior isn't exactly plush, nor particularlry spacious or practical, and its infotainment feels decidedly old hat. The trouble is, you're having so much fun driving it, you rarely notice. Well, the good news is that the latest Fiesta ST has been improved on just about every front. The driver benefits from a supportive seat with excellent adjustment (the old car's front seats had quite a small base) and a steering wheel that's movement is similarly wide-ranging. Front space is excellent, too, so all shapes and sizes of driver should be able to get comfortable. Helping the ST stand out from the rest of the Fiesta range inside is a leather sports steering wheel, figure-hugging sports seats, carbon-effect trim inserts and ST badges. In the back a couple more adults will find it more of a squeeze behind those in the front, while three side-by-side will be downright uncomfortable. However, this is a small car, and it's not like a Peugeot 208 GTi or Renault Clio RS offer more space for rear passengers. Three and five-door STs will be available, though, the latter offering improved rear access. The ST's boot is nothing to write home about either, but it'll handle the weekly shop or a large suitcase without issue and is also on a par with rival efforts. Where the Fiesta is noticeably better is its infotainment. 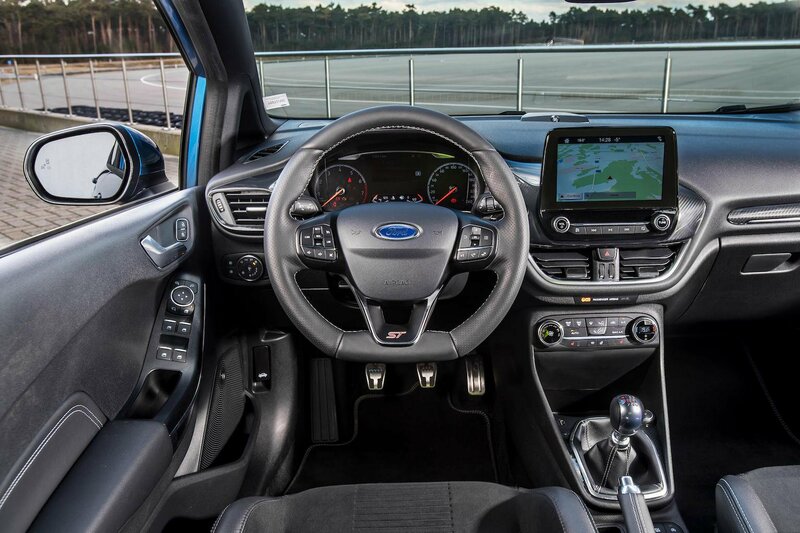 Although not confirmed, it's likely the ST will get the 6.5in-screen version of Ford's Sync 3 system as standard, while an 8.0in version will be optional, or possibly standard on the range-topping ST3. We've tried the latter and its bright and relatively simple to use. Our only real complaint is that there are no physical shortcut buttons to make it easier to hop between functions. Still it's far better than the 208 or Clio's systems and a world away from the previous ST's. And interior quality has taken a huge leap forward too. OK, so the ST is hardly a luxury car inside, but its plastics are far better than before and its switches feel more substantial. For a full break down of the standard Fiesta's interior (on which the ST's is based) head over to our full Fiesta review.